The Little Black Cormorant is a small, slim, totally black cormorant with a greenish sheen to the back and a slender grey hooked bill. In the breeding season, adults have fine white flecks on the head and neck and the green tinge becomes more bronze. This species congregates in larger flocks than other cormorants and flies in V-shaped formations. The Little Black Cormorant is one of only two totally black cormorants in Australia, with the other being the much larger (70 cm - 90 cm)Great Cormorant which has a yellow bill, face and throat and a white chin. The Great Cormorant also flies more often in long lines than in V-shaped formations. The Little Black Cormorant is found throughout Australia, including Tasmania. It is also found from Borneo and Java, Indonesia, to Papua New Guinea, Vanuatu, New Caledonia, Solomon Islands, Palua and New Zealand. 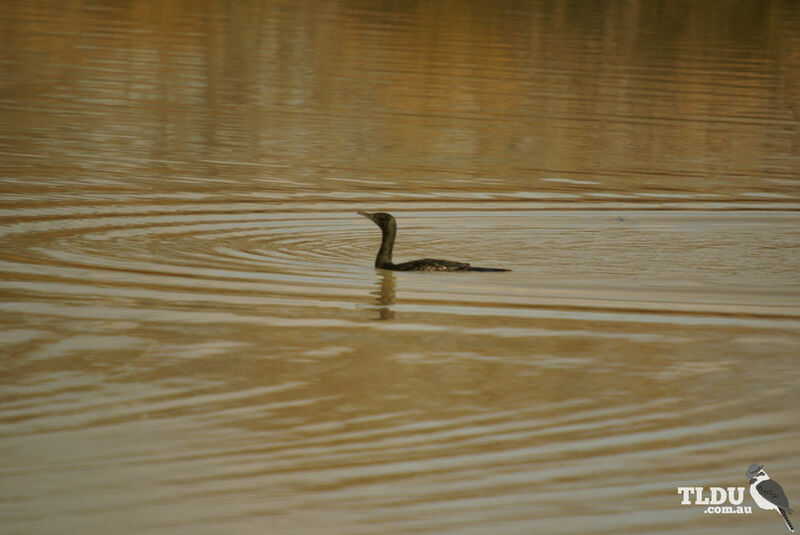 The Little Black Cormorant is mainly found in freshwater wetlands, but will sometimes be found on sheltered coastal waters, and can use relatively small, deep water bodies. It is strongly aquatic, seldom being seen on dry land, but is often seen resting on rocks, jetties and other perches in water. Nomadic, leaving coastal habitats when inland waters are plentiful. The Little Black Cormorant feeds on fish, crustaceans and aquatic insects. It catches prey underwater, by diving and swimming using its large, fully webbed feet for propulsion. It has special nictitating membranes that cover and protect the eyes underwater. As their feathers are not waterproof, cormorants are regularly seen perched with their wings outstretched to dry after fishing. The Little Black Cormorant nests colonially, often on the fringes of heron or ibis colonies, building large stick nests in the fork of a tree or on the ground. Both sexes share nest-building, incubation and feeding of the young. The Little Black Cormorant's favoured habitats of deep open waters and estuaries have been less affected by drainage, but some breeding areas are threatened by increased salinity, grazing, land-clearing and more frequent burning.